Thanks to an enthusiastic crew of volunteer groomers, and with the support of the Elizabeth R. Bright endowment, winter visitors to Acadia can enjoy some of the most scenic cross-country skiing around (dare we say anywhere?) on the park’s historic carriage roads. An agreement with the park allows groomers to maintain cross-country ski routes if new snow exceeds six inches and the road bed is frozen. This information will help you pick a good route for your adventure. While groomers generally follow the routes illustrated on the map below, some areas within the routes listed may not be groomed. The information on this page is accurate to the best of our knowledge; conditions may change between the time the routes are groomed and the information is posted. You can help us keep this information current—skiing in Acadia has always been a community effort and we hope everyone will contribute! If you are out skiing and notice that conditions are different from what is listed on our website, please post to our Facebook page or contact us at 207-288-3340 or info@friendsofacadia.org. In addition, Acadia National Park posts grooming status updates to their Twitter feed @AcadiaNPS. The flattest sections are the connector between Eagle Lake and Witch Hole Pond (6 – 4) and the west side of Eagle Lake (6 – 8). A little more hilly but still wonderful are the Witch Hole Pond Loop and Upper Hadlock Loop. I recommend doing Upper Hadlock in a clockwise direction if you’re doing it for the first time; it features a steep uphill approaching 13 – 21, but is otherwise mostly downhill. Paradise Hill (1 – 3) has great views, and will add another hill to the Witch Hole Loop. 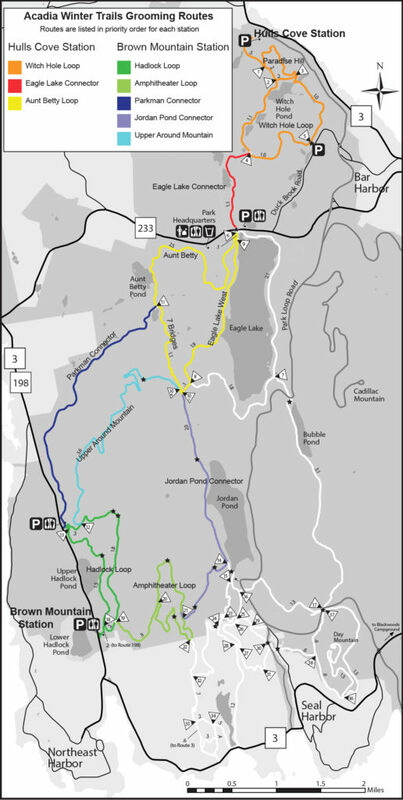 From Parkman Mountain parking to Aunt Betty Pond (13 – 11) is a long, gentle hill—but keep in mind that you’ll have a long gentle uphill on the way back! The Amphitheater has great views and takes you over a couple of Acadia’s historic carriage road bridges; the north part (20 – 21) is easier than the south part (20 – 22 – 21). Two last words of wisdom: avoid going down the Seven Bridges road (10 – 11) if you’re not comfortable turning at high speed, and Upper Around Mountain (12 – 10) is the least likely to be groomed and most likely to have bare patches and drifts. Keep in mind that the Acadia Winter Trails Association is a volunteer committee; grooming is done at times that are both convenient and safe for our volunteers. For the first time this winter, we have regular trainings planned for our new groomers—so there’s a better chance that someone will be available to hit the trails when new snow falls. Get out there and enjoy! Wonderful information! Thank you. I was wondering if there are suggestions for where to stay if we would like to come to Acadia to cross country ski. Are most of the inns and restaurants closed for the winter? Many are closed, but there are definitely some options. The best place to ask would be one or more of the area chambers of commerce. We have a list of the chambers’ websites at http://friendsofacadia.org/links-to-additional-local-organizations-and-resources/. It’s looking like rain this Sunday and Monday, so if you’re able to come sooner…do! Does anybody know which Carriage Roads are prepared for cross country ski this Sunday 25 morning? Hi Vivian: I’m sorry that you didn’t get a timely reply; we’re a small organization and don’t have staff to update the website on weekends. If you don’t see current conditions on our website, I recommend also checking http://www.facebook.com/friendsofacadia where we post updates with the hashtag #SkiAcadia and also ask other skiers to post about conditions they’ve observed. You don’t even have to have a facebook account to read posts, although you do have to join in order to post yourself. Are the carriage roads skiable after yesterday’s snow? Will any grooming be done before tomorrow (Sunday)? Can’t wait! !